In the aftermath of the devastation of Nanzhao, Cobra's internal conspiracies come into the light. Enjoying a glass of champagne, the Baroness sits in the ruined Santa Cruz mansion of the final member of the Cobra Council, whose armed guards she has slaughtered to get to him. While the Baroness monologues about the injustice of the decadent lives of dictators, the last Council member begins to choke as his legs — tied to a noose around his neck — begin to cramp and straighten out, cutting off his air supply. The Baroness settles in to watch the man die, but she is surprised by the former G.I. Joe agent "Chameleon", who puts a sword to the Cobra agent's neck, having been chasing her since she murdered the first member of the Council in the Pyrenees — but the Baroness is too fast for her, throwing her drink in "Chameleon"'s face before taking aim with her submachine gun. The Joe agent slices her foe's weapon in half and the two grapple, with "Chameleon" eventually getting the advantage and pinning the Baroness on the ground; but the Baroness refuses to tell her anything, biting down on a capsule that the Joe assumes contains poison... but actually contains antidote, with the poison being in a vial that the Baroness shatters on her opponent's face! Threatened with death in thirty seconds, "Chameleon" does the only thing she can: "kissing" the Baroness square on the lips to get what antidote she can before the aristocrat throws her off and stalks away, leaving the Joe agent on the floor. In a Cobra camp in south-east Asia, a Nanzhaoese member of the Coil prostelyzes to a group of civilians, to Serpentor's satisfaction. He doesn't have long to appreciate the spread of his religion, however, as another member of the Coil comes running with a message from Pythona: the woman from the Santa Cruz mansion, a follower of the Coil, has called in to report the death of the Cobra Council. Meanwhile, in Cobra's trophy room, Cobra Commander interrogates Tomax Paoli; while the Nanzhao campaign has revealed much about his lieutenants, he doesn't know where he stands on Tomax, prompting the businessman to explain himself. Tomax explains that his value to the campaign was in using his connections and influence to weaken G.I. Joe before they could even reach the battlefield, but the Commander is unconvinced, noting that Tomax's phone's signal was scrambled and invisible to the Commander's channels; going forward, he orders that all of Tomax's communications be made on an open channel, giving Cobra Commander full access to them. As he leaves, Tomax passes Serpentor, who is on his way to his own audience with the Commander; suspicious of the Coil leader's intent, Tomax returns to his office and asks to be put through to his contact on the Council... but the channel is dead, having been offline for five days. Realising what must have happened, Tomax arranges to meet with his co-conspirators Serpentor and Major Bludd in a hangar in ninety minutes' time... and to have his jet fuelled and swept before then. An hour and a half later, Serpentor enters the hangar, where Major Bludd gripes about Tomax's lateness, and wonders whether Serpentor's men should be there for discussion of a coup against the Commander... prompting the Baroness to step out of the shadows, Serpentor having exposed the coup to Cobra's leadership on learning of the murder of the Cobra Council. While Bludd tries to expose Serpentor as a willing participant, noting the dossier of information and DNA evidence that he had been shown, he notices a left-behind note from Tomax that reveals that Bludd had been set up while Tomax escaped. With the Baroness arguing with Serpentor, Bludd takes the opportunity to flee into the jungle, where he tumbles off a cliff into a river; and when the Baroness orders men to go and find Bludd to ensure that he doesn't escape, she discovers that Tomax had left on his personal jet eighty minutes before, and is nowhere to be found. Bludd crawls out of the river, where he encounters a squad of United Nations soldiers, who he begs for asylum on the basis of his American citizenship... but when they refuse to take him under their protection, he shoots one of them in the head to force them to arrest him instead. In the Commander's trophy room, Savane gives him a final rundown on the status of Cobra's invasion: though they have no B.A.T.s to occupy the country, the Coil will continue to spread across the region, while the former population centers will be dangerously irradiated for the next fifty years, and they have China's gratude for leaving their pipeline to the Bay of Bengal untouched. The Council has been eliminated, but though Cobra Commander is now autonomous, their resources cannot be used by Cobra... though the Commander is unconcerned, not believing that they'll need it. Thanks to Ronin, G.I. Joe know about the deaths of the Council, and Bludd, Tomax and Storm Shadow have all gone off the grid and cannot be found, but the Commander finds these losses acceptable. Hesitantly, Savane notes that the Commander has been spending so much time amongst the artifacts and treasures of Nanzhao that she's increased the trophy room's security to equal his quarters; the Commander notes that the artifacts remind him of a feeling he had long ago, but when Savane begins arranging to have the treasures brought with them when Cobra departs, he cuts her off... and orders her to burn it all, the last shreds of his former life finally erased. "The problem with unjust dictators is, though the last few minutes of their lives tend to be desperate and agonizing, that's nothing compared to the decadence and indulgence of every other minute they lived. But still. Those final moments..."
"Menasian — you sold me out?!" "I exposed Tomax and your sedition after you tried to recruit me, of course. I would never betray our Commander. Kill him, Baroness." Bludd, Serpentor and Tomax arranged a coup in Part 6 of Cobra Command, which was the same issue as the Baroness began assassinating the Cobra Council and Chameleon/Ronin was deployed to track her. Cobra Commander feels a connection to the artifacts of Nanzhao because he grew up in the region, as shown in the 2012 Cobra Annual; his fight for survival in the Golden Triangle is implied to have been his true motivation for invading the country. 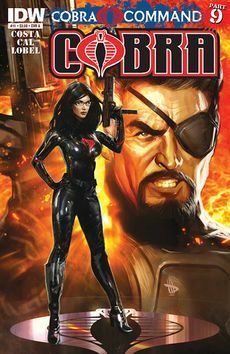 Cover A: The Baroness and Major Bludd, by Dave Wilkins. Cover B: Ronin, by Antonio Fuso and Arianna Florean. Cover RI: Cobra troopers, the Baroness, Major Bludd, Destro, and Cobra Commander's other arm, by David Williams and Kelsey Shannon; combines with the RI covers to Cobra Command, Part 7 and Cobra Command, Part 8 to form a complete image. This page was last edited on 8 October 2017, at 11:10.